What’s so terrible about an intractable conflict if it keeps you flush with cash? 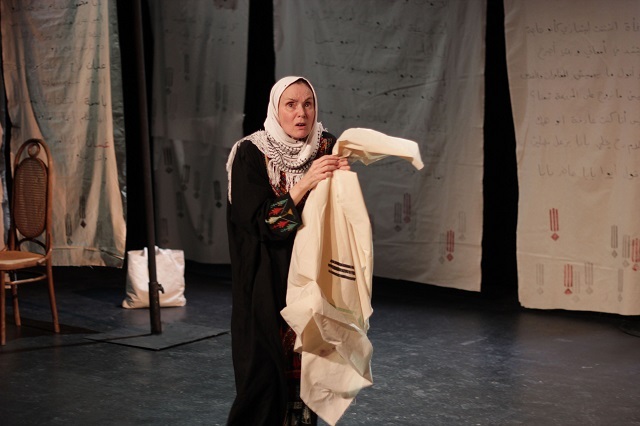 That is not actually the story of Ahmed Masoud’s play, The Shroud Maker, a one woman show starring Julia Tarnoky that has just finished its last performance at London’s School of Oriental and African Studies (SOAS) this month. The titular old woman may be overcharging bereaved families, of which there are plenty in Gaza, but that is just a bit of embroidery over a much larger tapestry. Like most dramatised stories of Palestinian lives, the individual blends with the collective. Our main character is a grieving daughter, mother, and grandmother, existing as multiple generations of Palestinian women — from the Nakba to the Intifada — in the same person. Souad is not a hero, though. Despite her unique mercantilist morality, she is completely ordinary. We open to a small house with a workshop in Gaza, where our narrator is busy sewing her funeral shrouds to the sound of drones overhead. Souad is eighty-four years young and happily chatting away to us about the good fortunes of her business in death. The Angel of Death, and the Israeli military, have smiled upon her. She takes pride in her stitches, telling us that even the most hideously war-mutilated corpse will look good in one of her fine shrouds. However, she laments that lately the Israelis have taken to killing fishermen who stray beyond the maritime borders, whose bodies are then lost to the sea. This is not good for business, she quips — she can only make money when there is a body to be buried. Souad could have made her money by embroidering baby clothes. She tells us early on about the “reproductive resistance” her neighbours are practicing, and snickers about the “naughty pills” coming through the smuggling tunnels. Certainly there would be enough business in young life, but Souad’s personal story has been filled with loss and death. Over the course of the play, an elastic Tarnoky becomes several characters, including a younger version of Souad, Souad’s father, and an aristocratic British woman who used to treat her like a pet. 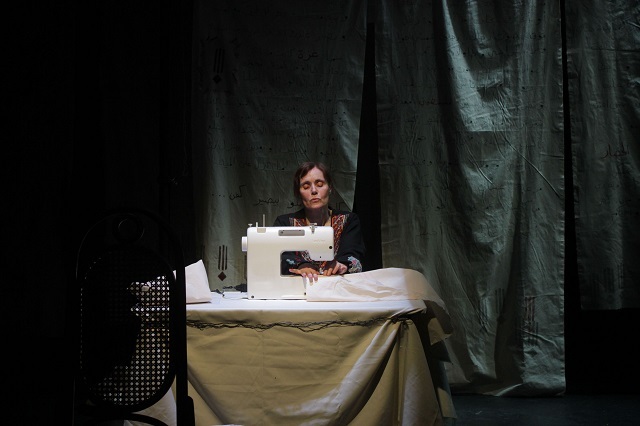 She takes us through Souad’s seams of memory, beginning with a scene from the Nakba where she hides from soldiers in a mansion, keeping her young mind sane by focusing on the mundane task of sewing. For Souad, death and sewing are intimately connected. When she finally emerges from her hiding place, she finds the body of her father and covers him with the garment she had been making especially for him. “Everything I make becomes a shroud,” she says. It would not be the first time she would improvise such a farewell to a loved one. By the end of the play, as Souad’s great losses are revealed. Takorny’s performance shows us that although the character’s plight evokes pity, she is an independent woman who struggles to retain control over her life. Despite those few admirable traits, it remains hard to say whether she truly is a villain, or merely the product of a villainous war. Surely she carries the responsibility for exploiting the deaths of her neighbours for profit? Who else should we direct our anger towards? The Shroud Maker, or the ones who make the shrouds necessary? Nearly every performance of the play this past summer has coincided with a deadly event in Gaza. The Great Return March began on 30 March this year, to coincide with the commemoration of Land Day. Israeli forces have responded with deadly repression of the protests, shooting journalists wearing press gear and paramedics in white coats. As of the writing of this review, an estimated 205 people have been killed and a further 18,000 injured. In his introduction to the play, Masoud wonders aloud: If Gaza sees a reprieve, should he stop performing the play? He reminds the audience that the night was not about politics, but about the human journey; that it’s okay to laugh at his crass jokes. While the context of the performance adds an extra layer of tragedy, Masoud’s gallows humour is more than welcome.